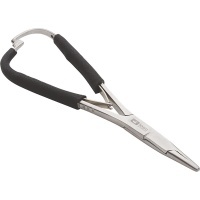 Made of the highest quality surgical steel, these Loon Mitten Scissor Clamps are precise enough to use year 'round, but are specially designed for when it is too cold to take your hands out of your gloves or when you are wearing your mittens. The Mitten Clamps are opened and closed with a simple squeeze of the handles, making them easy to clamp on to your waistcoat. 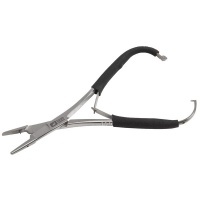 Perfect for removing hooks and removing the barbs from hooks.